Delay of boundary-layer transition along a flat plate with adverse pressure gradient is achieved via dielectric barrier discharges. In contrast to earlier investigations, transition is initiated by naturally occurring Tollmien–Schlichting waves. A single dielectric barrier discharge actuator is used to create a body force that locally alters the flow stability leading to an attenuation of broadband disturbances. Hot-wire measurements characterize the resulting transition delay, and particle image velocimetry clarifies the local influence on the velocity profiles. Linear stability theory is applied to analyze a numerical solution of this boundary-layer flow, showing good agreement with the experimentally measured data. The stability analysis shows that disturbances are locally attenuated and transition is correctly predicted to occur at Reynolds numbers increased by 10 %. In contrast to previous investigations, the experiments are conducted at a reasonably high free-stream velocity of 20 m/s paving the way for planned in-flight experiments. 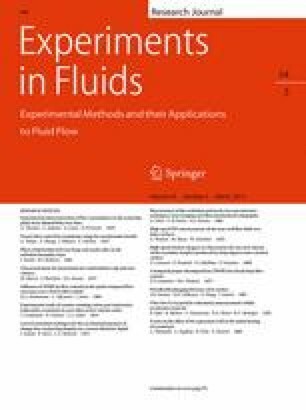 This article is part of the collection Topics in Flow Control. Guest Editors J. P. Bonnet and L. Cattafesta. This investigation has been partially sponsored by the Air Force Office of Scientific Research under grant FA8655-09-1-5012 supervised by Douglas Smith. The U.S. Government is authorized to reproduce and distribute reprints for governmental purposes notwithstanding any copyright notation thereon.